@f.sjl: Is pure libertarianism a realistic ideology? Don't libertarians in politics somewhat arbitrarily decide which freedoms matter to them more? Pure libertarianism? Well, I wrote a book (The libertarian mind) on my vision of libertarianism. I think a rule of freedom except where you interfere with other people works well. And certainly the more libertarian existing countries are, The better they work. So I think we could push further. Arbitrarily? Well, everyone has their own interests and preferences. No one can spend all his time on every issue. But a lot of libertarians may focus more on economic issues than issues of personal freedom. @totalhillmove: What happened to the '13 libertarian revolution? Was it over estimated or did it die? 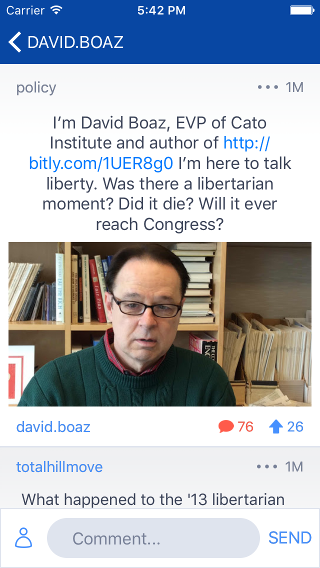 I'd say the libertarian moment was overhyped. But the tea party, marijuana, marriage, and out rage over surveillance all do show growing libertarian tendencies. @sam.ward: David, assume Hillary is elected president and you find yourself briefing her on one big bold libertarian idea for her to pursue in 100 days. What do you think would be the most persuasive policy proposal to pitch? Hillary seems the least amenable politician to a libertarian pitch. Can't imagine pushing Social Security reform, or a restrained foreign policy. So I'd go for criminal justice reform, including asset forfeiture, 1033 reform, and ratcheting down the drug war. @sam.ward: Second question, same scenario trying to brief a President Trump, what do you think he'd be receptive on for a libertarian policy proposal to push? I have no idea what trump’s preferences are. So what to urge? A big tax cut, maybe. Maybe criminal justice reform. And maybe a more coherent critique of foreign intervention. @sam.ward: David, what do you see the role of Cato in the DC libertarian ecosystem versus other centers like Mercatus or Niskanen? I don't want to make comparisons between Cato and our friends at other libertarian organizations. I would solicit your thoughts on that. @leviathan: If I don't value freedom/liberty as an overwhelming deontological good and if I'm generally more concerned with welfare maximization (broadly construed), what does libertarian thought have to offer me as I think about how to best advise my boss? No deontological commitment to liberty? For shame! But we know from economic theory and history that free markets work, and socialism, centralization, and regulation work less well. Libertarian economistdon't make deontological arguments. They examine the results of taxes, regulations, prohibitions, etc. @doug.stamperer: Which candidate is more likely to legalize pot? The voters seem more willing to legalize pot then any politician. @f.sjl: How would you pitch a libertarian approach to economics as a solution to the issue of economic inequality? Inequality itself doesn't bother me much. Poverty does. Free markets are the best cure for poverty. Also, government should stop engaging in crony capitalism and regressive regulation. Stop redistributing upward. @federal256: David, how so you suggesting a libertarian approach on items that don't have a natural market but may be necessary for defense? There are a few public goods, like national defense. Probably fewer than most people think. But for Defense we need government, and some inefficiency and politicization will be inevitable. @thomas.jefferson: Was Ron Paul so popular in the 2012 presidential race because of his charisma/personality, because of his views, or because he was the anti-establishment candidate? And what does a future candidate need to do to replicate or build upon the elder Paul's success? I think it was Ron Paul's views on smaller government and staying out of war, combined with his quirky nonpolitician personality (sort of like Bernie Sanders). A candidate who seems more "normal" – governor, senator, not over 70 – could hopefully take that message further. @f.sjl: Where do you draw the line on regulating the market? On regulation, I'd like to draw the line at regulating things that infringe on other people's rights. But Regulation magazine publishes 50 articles a year, with much more nuanced analysis. @wholistic.thinker: Do you think libertarian policies in general is better suited for rural/low population density areas and are not practical in urban areas? It's easier to avoid conflicts with other people in rural areas. But libertarianism or classical liberalism really emerged with the emergence of a more urban and capitalist economy. So I think rules that respect rights, protect property, and allow cooperation to flourish are especially important in urban areas. @f.sjl: Is coercion by private entities acceptable to libertarians? Economic coercion. What coercion by private entities? Private entities never arrest anybody. @thomas.jefferson: Economic coercion isn't a thing. How do you force someone to do something through economics? You can change their incentives but you can't force them to do anything or take their property or spy on them through economics. Claims about economic coercion are too complicated for this format. But I would say that real economic coercion occurs in socialist economies, and that making people offers is not coercion. @malcom.tucker: Hey David, do you think that freedom and liberty are synonyms and can be used interchangeably when talking about government/ideology? Philosophers may think freedom and liberty are different. I'm a simple country boy from Kentucky, and I use them interchangeably. Maybe liberty sounds a little more legal, while we use freedom in a more general context. @mozart.was.a.red: David, what do you think about the libertarian case for Bernie Sanders? There’s a bad libertarian case for Bernie Sanders: "hey, he likes Denmark, and Denmark is pretty free.” I think the better case is this: sanders can't get his bad economic ideas through a Republican Congress. But he can extricate us from endless wars, and pull back on surveillance and the drug war without Congress. So actual effect might be better than you would think. @sam.ward: David you and Cato have been big advocates in defining libertarianism among the general population very broadly and not specific to a litmus test or check list. Could a similar approach with members result in a large group of libertarian learners? I don't know. I'd ask y'all what the prospects are for moving members in a libertarian direction. Of course, we do distribute our studies to all offices, and invite staff and members to seminars.